I have been thinking about installing a drip irrigation system around the home. I still pull the garden hose out to water my plants and yard. When my wife took over for me one day, she found that it was a relaxing experience. One problem though is that she is convinced that I do not water, so she waters again, causing us to over water our plants.With a sprinkler system, we would know that the yard is being watered, so she will not go to water again once I have. In my early college years, I used to work on sprinkler systems, and I always thought that installing a system was not beyond the scope of most homeowners. The point of this post, however, is to indicate problem areas to watch. The most common issues with a lawn sprinkler system comes from non-use, improper planning, or forgetting to adjust the programming. Builders who set up a sprinkler system do so based upon a few standard planting scenarios. The plants are not in place, or few plants are. The builder knows that the grass and other plants need to be over watered to establish the plants. (For example, seedlings need watering about every other day, and newly planted grass can be the same). The builder mentions that a readjustment is needed, but the homeowner forgets. Next comes that perfect bush, which is set to grow around and over the sprinkler head. The water from that head serves a fraction of the area that it was intended to water. This is where the proper planning can help. When the system is not used, I find the grass growing over the pop-up heads. The heads cannot come up, so no watering occurs. Did you know that this was part of your sprinkler system? Older systems have this lower to the ground. It is is a u-shape coming up from the ground. There are two valves in the line, and then there is a safety device for high pressure. Currently, you will see the pipes coming up about four to five feet from the ground. They are also close to the house. In older sprinkler systems, we may find this near the building, but you could frequently find them out in the yard. 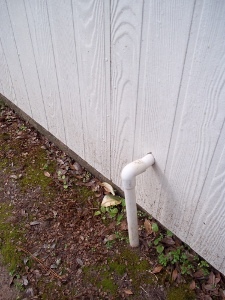 My experience is that these pipes are hit by the lawnmowers, causing damage to the pipes or connections. I prefer seeing these attached to the wall, or somehow protected from damage. I do not see leaks at the valves often, but when a system has been in place for ten years or so, I do discover leaks at the valves or pipe connections. Wiring conduits should be securely attached to the home. When we have electrical lines running in conduit, we are a bit better about attaching them to the wall. The lines for the controls for the sprinkler system do not obtain the same treatment. This pipe has already been hit by a lawnmower. Since the conduit is not attached to the wall, the wires can become frayed with repeated hits. I do not find these covers around every home sprinkler system, but you do often see them. I have not found many issues here, except the cover may be missing or damaged. 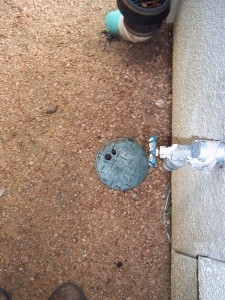 I wanted you to see this cover to know that this is part of the sprinkler system. This is where you will find wiring controls for the system. I did discover that someone had been playing with the wires, disconnecting part of the system. The control panels can be in the garage, but also can be outside. Most commonly, I see units with four or six systems set up. Your control panel may have six settings, yet there may be only four zones (stations). How many stations you need depends upon your gardening plan. I found that most homes do well with the four station set-up. The zones may not be simply: front, left, rear, and right. One station could be the front garden beds and the sides. Then another station will be sprinklers for the grass. It is better to have a manual to plan out your programming; however, you can find basic instructions on the interior door panel when you open the unit. The biggest problem here is that the control panel needs to be plugged into an outlet. The plug is removed when people install shelving or equipment is is plugged into the same outlet. There is the brief tour of this system. I do encounter sprinklers that are spraying more sidewalk or driveway than lawn or garden. These can be adjusted (this is where having the manual comes in handy, because they will have a description of the heads. 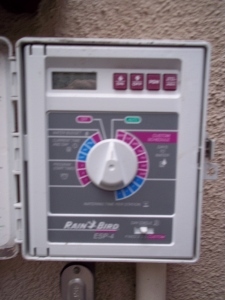 Builders typically leave the manuals attached to the control box. Good luck with your system. 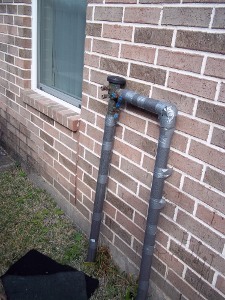 This entry was posted on Wednesday, February 23rd, 2011 at 4:00 pm	and is filed under Home Maintenance-Consumer Info. You can follow any responses to this entry through the RSS 2.0 feed.